This decadent soup is a Wisconsin classic. 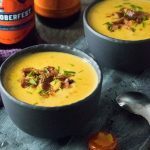 Beer cheese soup is creamy and comforting with just the right amount of diced vegetables for great texture and flavor! For me, when fall hits it is all about soups and Octoberfests. I look forward to seeing that first 6-pack hit the shelves with that familiar orange packaging announcing the arrival of fall and my favorite seasonal beers, so it would only stand to reason that the ultimate celebration of this season would be a combination of a comforting soup and that classic marzen style lager. I swung by my local Meijer store to grab all of the ingredients for this soup because Meijer has a phenomenal craft beer department. There is never a shortage of great options to choose from, though a few of my recommendations would be Octoberfest beers from Samuel Adams, Hacker Pschorr, or Bell’s. Better yet, buy a pack of each and have your own taste test to determine your favorite! 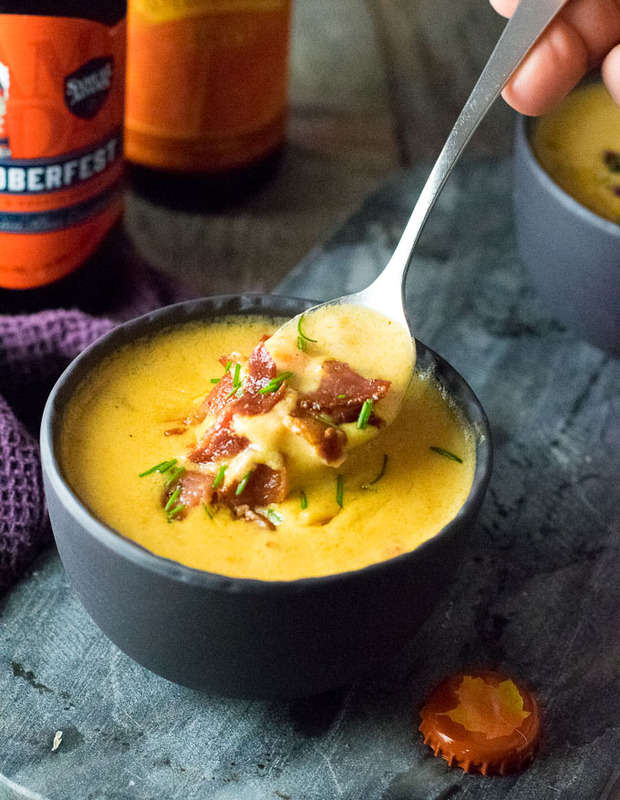 Beer cheese soup is a comforting Wisconsin classic that features a creamy Cheddar broth that is infused with the flavor of beer. 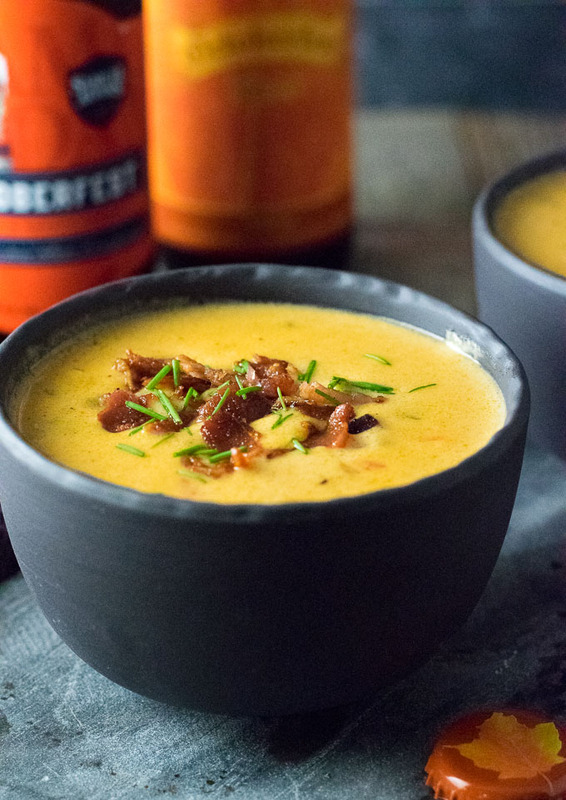 Most beer cheese soups have diced vegetables mixed in, but this is optional. If you are looking for an even heartier soup, pick up some freshly made Meijer bratwursts at the meat counter, chop them up, and add them to the soup as well! 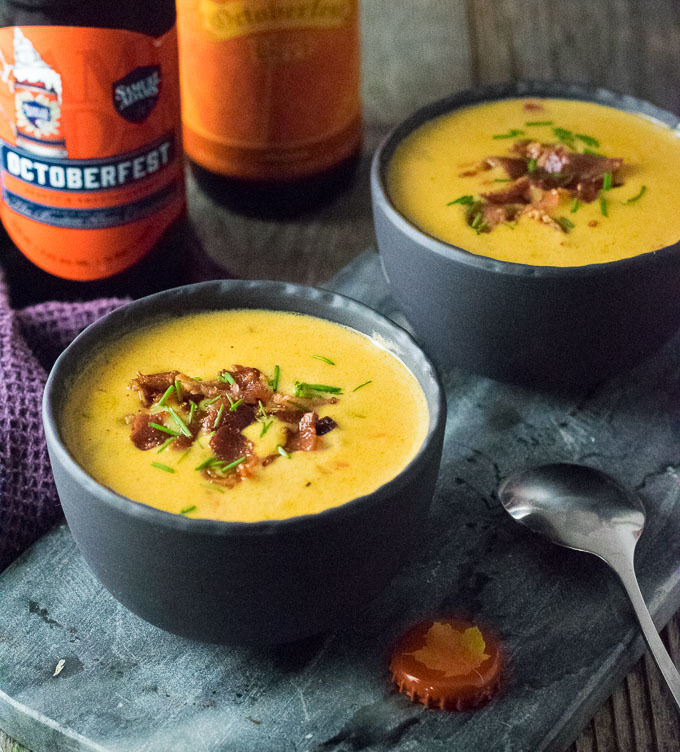 If fall is in the air, I recommend using a marzen style lager for this soup, more commonly known as Octoberfest beer. It is malty and flavorful without overpowering the soup. 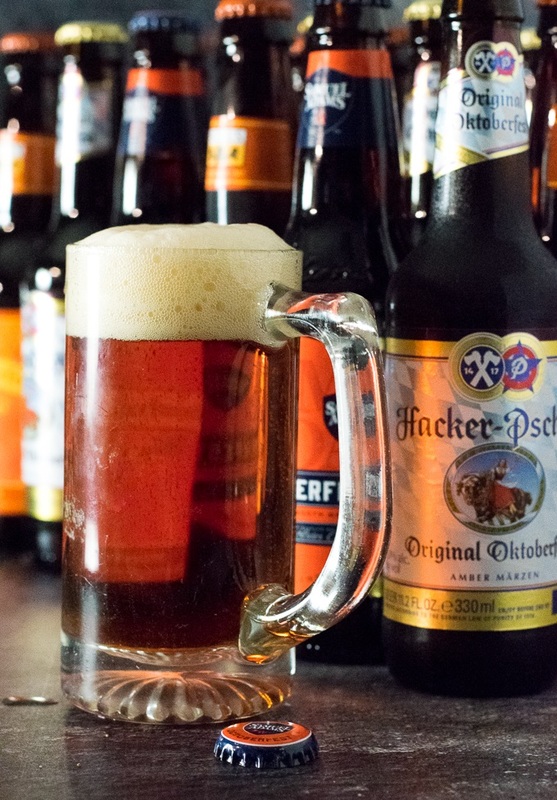 You can often even find Hacker Pschorr Oktoberfest all year around. However, you can still make a great beer cheese soup even when you cannot find marzens on the shelf. Any malty beer would be a good substitution, though I would stay away from overly hoppy beers to prevent the soup from being bitter. 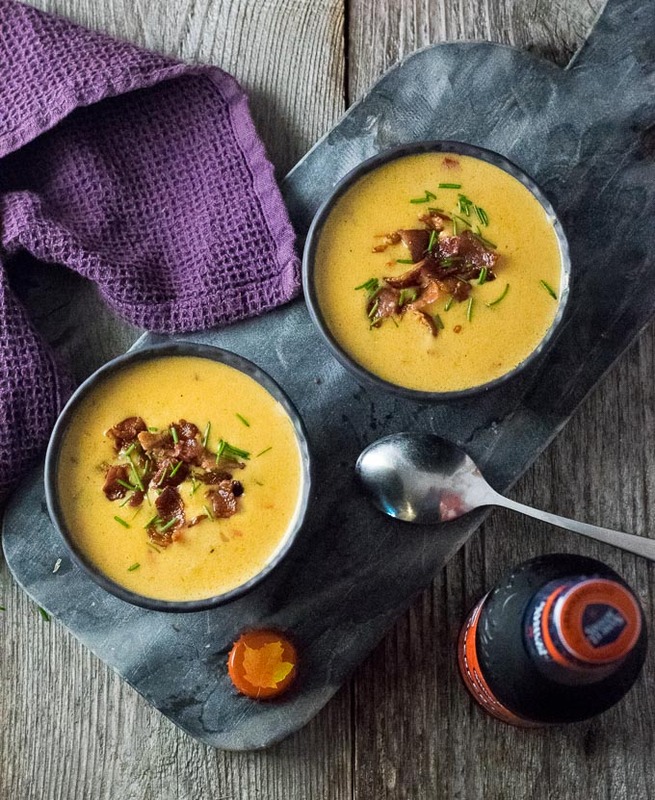 Sharp Cheddar cheese will add the best flavor to this soup, however, you can customize it to fit your tastes by mixing and matching your favorite cheeses. For example, I debated strongly on whether I should substitute 4 ounces of cream cheese in this recipe for the comforting subtle creaminess it provides. For more of a kick, Pepperjack cheese would be another fantastic substitution. You can find a wide assortment of all these cheeses at Meijer. I recommend sauteing any vegetables you add to this soup to ensure they are deliciously tender when the soup is done. Sauting will also coax out additional flavor. To save on unnecessary cleanup, I prefer to saute in the same pot or Dutch oven that I create the soup in, however you can certainly multi-task by sauteing the vegetables as you start the roux for the soup. When making the roux, make sure to turn the heat down so you don’t burn the flour. You want to continue stirring the roux while it cooks for this same reason. It is best to add your liquid into the roux a little bit at a time because this will allow it to incorporate smoothly. Finally, melt your cheese into the soup, add the veggies and seasonings and you are ready to for dinner! Any leftover beer cheese soup should be stored in an airtight container in the refrigerator to prevent odors inside the fridge from seeping into the soup. The soup is best enjoyed within a few days. Heat 2 tablespoons of cooking oil in a Dutch Oven and add diced carrots, onion, celery, and peppers. Cook on medium heat until vegetables are tender, add garlic and cook for an additional 1-2 minutes, or until garlic is fragrant. Remove vegetables from pot, turn pot on low and add 1/3 cup butter. When butter is melted sprinkle in flour and whisk continually to form a roux. Cook the roux for 3-5 minutes while whisking. Slowly add Half and Half to the roux, whisking to combine. Then add chicken stock and beer. Add Cheddar cheese one handful at a time until it is completely melted into the soup. Mix in mustard, Worcestershire sauce, seasonings, and return vegetables to the pot. Simmer for 5 minutes and serve topped with bacon or chives, as desired. This soup can be simmer considerably longer if desired. IF YOU LIKED THIS RECIPE check out my Creamy Potato Soup as well! 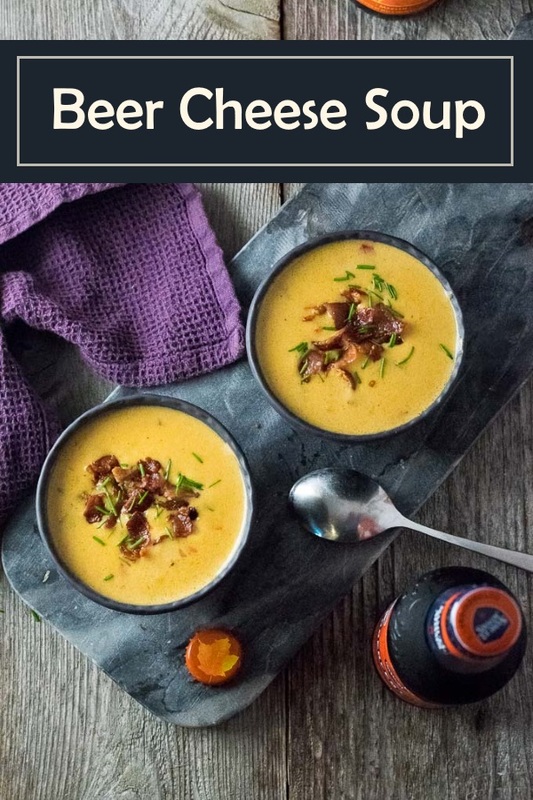 If you enjoyed reading my Beer Cheese Soup recipe then you should probably like me on Facebook and follow me on Pinterest too. That’s what I would do at least, because if you don’t get to know me but you still use my recipe it is kind of like taking candy from a stranger, and your mom taught you not to do that. Don’t disobey your mom, subscribe to Fox Valley Foodie today! Hi – Like your fedora. Just got my son one. Can’t recall which recipes I’ve tried of yours’ but just like your format. Will be making your beer cheese soup this week. Got Shlafly’s October beer (St. Louis) and Cabot Sharp Cheddar. At first I said “Oh I don’t make recipes with that many ingredients” But decided to try it. Will omit the celery as I am currently mad at celery (story about that) and will use more carrots. Maybe a few extra jalepenos – not many. One thing I don’t understand is.. do I put the vegetables back thru a food processor – I think I will as I want this to be a creamier soup – no chunks for us. 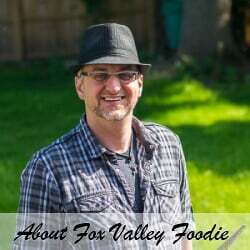 Okay – where are you located” There are Fox Valley’s in many states – but this recipe makes me think Wisconsin. We have a huge connection to Wisconsin (story about that). Okay – wish me luck with the soup. PLs advise any advice. Thanks for the comment. You are correct, I am from Wisconsin. You can certainly run the veggies through a food processor if you want a creamier soup, however I like the small chunks for texture. Your substitutions sound great, I hope you enjoy the soup! This recipe is good, I like sautéing some onions for this and putting in a cheese that doesn’t seem to fit like some Bleu cheese, or Feta, there are actually a number that taste good in this, but I also like throwing in a few anchovies, they really create a wonderful compliment of flavors. Thank you. Does the alcohol cook out of the soup? Yes, it still has the beer flavor but the alcohol will cook out.